Make word study fun and engaging for your students. The best way to teach vocabulary is to get our students to use vocabulary. 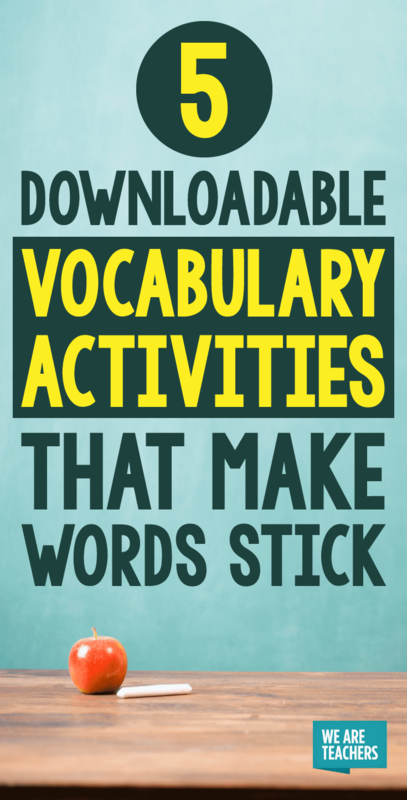 These five free downloadable vocabulary activities from Read it. Write it. Learn it. will help your students master their vocab list in no time! 1. 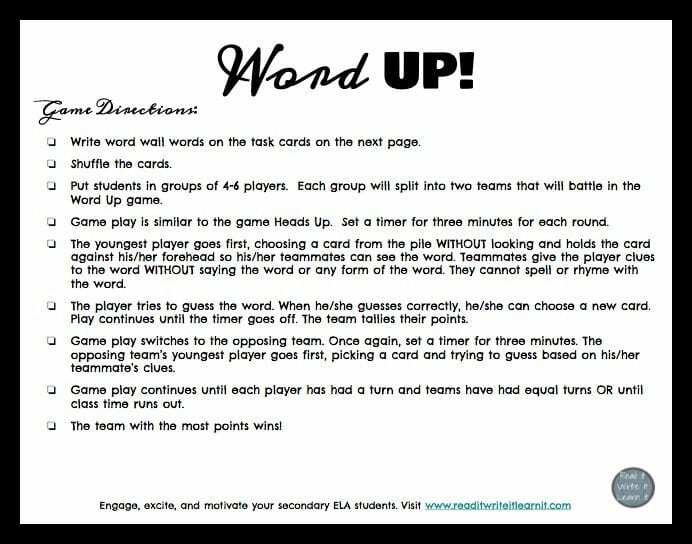 Allow students to choose their own vocabulary words with Word Up! Bookmarks. The best vocabulary words are chosen by students. Start by giving each student a copy of the Word Up! bookmark (I recommend photocopying on cardstock). Instruct students to copy down words they are unsure of or powerful words from their nightly reading. Encourage students to use context clues within the text to define their words. Model the process with them and practice in class. If students cannot unlock the meaning of words using the context clues, show them how to use print and online dictionaries for help. 2. 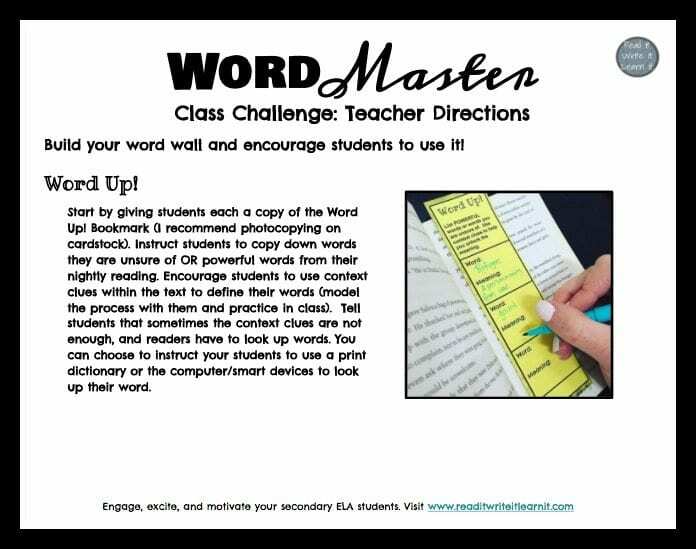 Set up a Word-Master Class Challenge. Once students start collecting vocabulary words, encourage them to use the words in their speech and writing. Use this downloadable to create a word wall and choose a word of the day. Then, enjoy the vocabulary magic that follows! The student who uses the word of the day most often during a class period wins the prestigious title of Word Master. 3. Teach definitions with a QR code project. QR codes are fun and interactive, and any student with a smart device can access the content linked to the code. 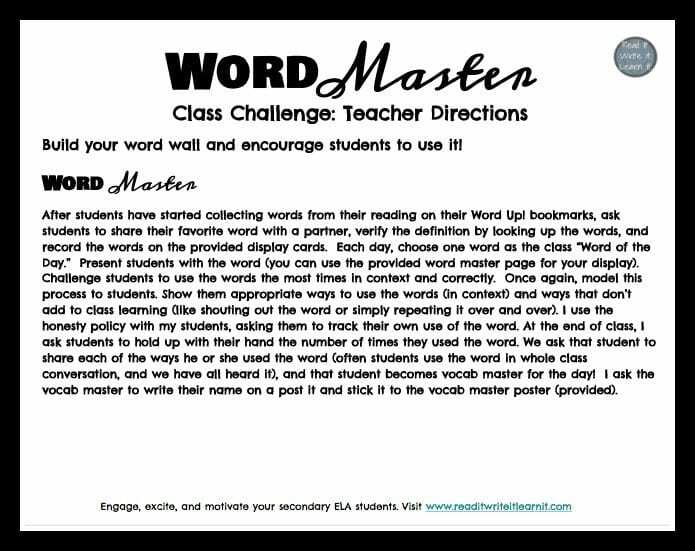 Use this downloadable to guide your students through the process of creating student videos that define word-wall words. 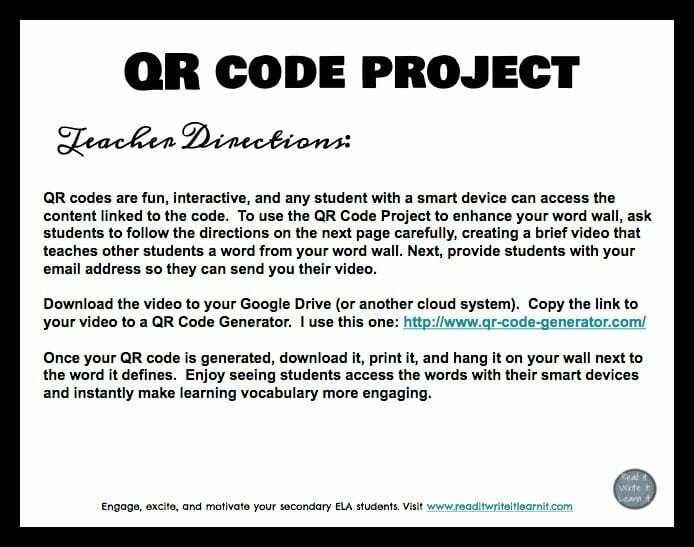 Students will then email you their videos, and you can use the provided link to create a printable QR code to add to your word wall. Students simply scan the code to view the video definition of each word on your wall. 4. Encourage students to use powerful vocabulary in their writing. Give students this printable chart to help them apply vocabulary from your word wall into their own writing. 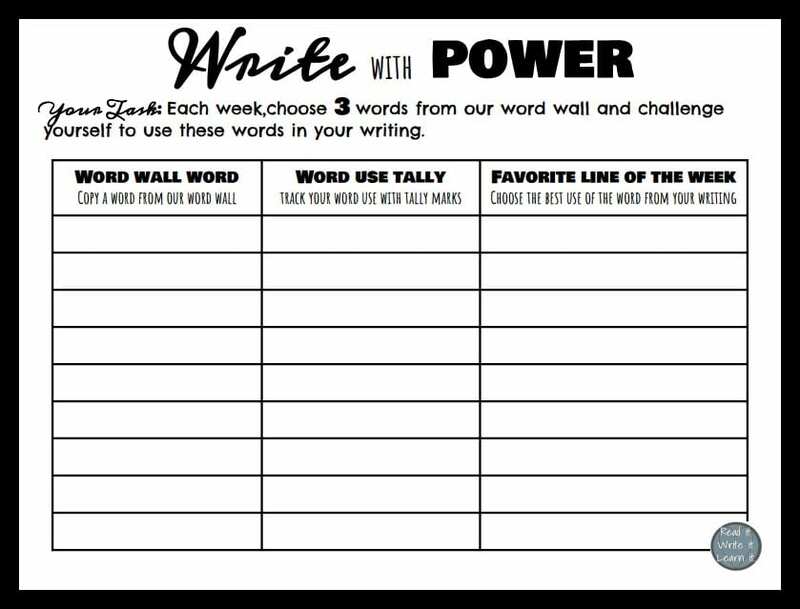 Students simply choose three words per week, challenge themselves to use the word in the proper context as often as they can, and then share their favorite line in the last column of the chart. 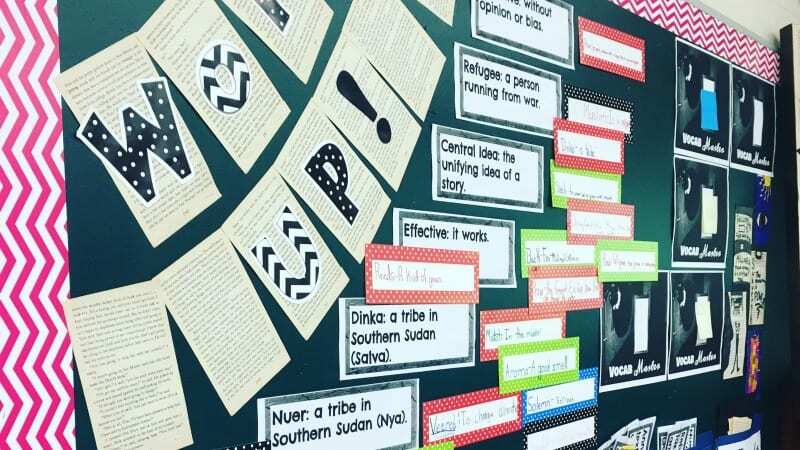 To extend this activity even further and deepen students’ understanding of the words, ask students to complete the Words With Power one-pager included in this download. This activity will allow students to share favorite lines from their personal writing, displaying the line along with the literal definition, figurative and connotative meanings, and visual representations of the word. 5. Play the Word Up! Game. Engage students in learning their vocabulary words with the Word Up! Game. This super fun game is similar to the game Heads Up. Students write all of their word-wall or vocabulary words on the provided task cards. After shuffling the cards, one student chooses a card without looking and holds it up to their forehead. The rest of the students provide clues that will help the student guess the word. Students will have a blast and learn new vocabulary at the same time! Learning vocabulary can be engaging and fun with the right tools. The key to making vocabulary stick is encouraging students to actually use the words we want them to learn. For more engaging and motivating vocabulary activities, check out the Read it. Write it. Learn it. store. Thank you for sharing the great resources! These will definitely come in handy! Although, I tried to click on #2 a few times and it keeps coming up a 404 error. Is this resource placed anywhere else that I could find it? Thanks in advance!